Boston Marathon 2019 training continues with Sunday Long Run Seven. This week we ran 14.3 miles and had 546 feet of elevation gain. Somehow this seemed harder than last week’s 16.2 mile run with 616 feet of elevation. And my pace was slower this week by 13 seconds per mile. It was a little colder than last week, but it was still below freezing last week. In any event, I got in my miles and ran some good hills. All of this will serve me well on April 15th when I make my 9th official run to Boston. I got up in plenty of time and had my coffee and toast. So I was properly fueled and hydrated. I managed to dilly dally enough to get to Melrose only 15 minutes before the run. I’m usually one of the first to arrive. Maybe I’m still recovering from a four day conference? I thought standing was better for you than sitting? I stood for almost three days. My watch took a bit to lock onto the satellites, so I was the last person to take off for the run. Before we hit one mile I caught up to a bunch of people and began to look for people running the full distance. There were probably 20 people going full, but I could only keep up with some of them! I knew I had to keep the person in front of me in view so I wouldn’t miss a turn. That meant I had to keep my water stops brief so I wouldn’t loose any one. Last week I ran with someone most of the run. This week I spent most of my time alone. I think that made a big difference in my run. When I run with someone I tend to talk a lot and that makes the miles just melt away. When I run by my self, I don’t have anyone to push me or distract me from my watch! This week’s run was similar to last week’s run and I pretty much knew where I was going. But not all the time! Since I didn’t have a plane to catch, I hung around at Bruegger’s for a while and enjoyed the company of my fellow runners. My go to drink is iced coffee with milk or cream. After my DEXA scan, I’m paying more attention to my calcium intake. The little bit of fat and protein in the milk doesn’t hurt the post run recovery either. We take over about half of the restaurant after our run. A nice cup of coffee, a bagel or sandwich really hit’s the spot after a long run. We don’t just talk about running, but it’s a very popular topic! I know that a lot of people have a running streak goal, Even if they only run a mile in a day, the streak continues. For me, running every day is way too ambitious. For 2019 I set a more attainable though still challenging goal of averaging 3 miles per day. That will get me beyond my year goal of running 1,000 miles. I often run around 800 miles per year, sometimes close to 900. But I’ve never run 1,000 miles in a year. In 2018 I ran just over 802 miles for an average of 2.2 miles per day. So far this year I’ve run 134 miles over 48 days for an average of 2.79 miles per day. In January my average was 2.58 miles and for February, so far, my average is 3.19 miles per day. Averaging 2.79 miles will get me to 1,018 miles and reaching 3 miles per day will get me to 1,095 miles. Next week’s long run is 18.1 and I have two more Tuesday night runs that will be over 6 miles each. If I manage to get in another 4 or 5 miles on the treadmill at work I’ll hit my goal for February. For March I have 3 half marathons, a 5K, four Tuesday Night Club Runs and at least one Sunday Long Run of 14.8 miles. With a few additional runs I should be able to hit my goal of 3 miles per day. Since March is the last full month before the Boston Marathon I’d like to kick my mileage to over 100 miles, possibly to 120 miles. It is well within reach. You may have noticed I haven’t mentioned much about marathon training. While I’m doing the long runs, keeping my mileage up and watching my diet, I’m not following any particular plan. I’m certainly not running 100 mile weeks. I rarely do. How is your marathon training going? Do you follow a plan or do you just increase your miles and spend more time thinking about running than usual? I think this year I’m going to work on strength and getting faster. The longest run I project is a 15K in Chicago in November. I haven’t run much this year. 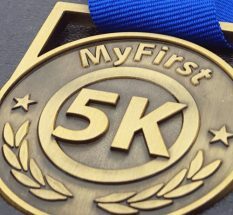 I ran a 5K for fun the first week of February, and I got out to run a 5K last night. I’ve been doing strength training and yoga to build up a base. I plan to get more serious in March. You are doing great!